” Academia Atlantika has received accreditation from the Instituto Cervantes . This means that it meets the conditions set by the accreditation system for centers of Instituto Cervantes conditions and thus acquired the only International accreditation which specializes exclusively in teaching Spanish as a foreign language ” . What is the Intituto Cervantes ? The Instituto Cervantes was founded in 1991 by the Spanish government with the aim of promoting the Spanish language and disseminate as well as the culture of Spain and of all Spanish-speaking countries abroad known to machen.Das Institute is a non-profit and public organization . It is the Spanish equivalent of the Goethe-Institut . The headquarters are located in Madrid and Alcalá de Henares , the birthplace of the writer Miguel de Cervantes . The Instituto Cervantes is the largest institution for the Spanish language worldwide. There are already more than 70 centers across five continents . 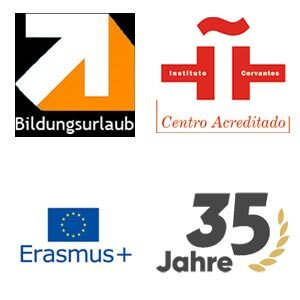 In German-speaking countries , there are six Cervantes Institutes in the following cities : Berlin , Bremen , Frankfurt , Hamburg , Munich and Vienna . Our Spanish language school ‘ Academia Atlantika ” is regularly reviewed by the Instituto Cervantes and certified . Who likes cares to read can read this informative PDF . To obtain this certificate , subject to an educational institution very strict conditions , et al teachers must have a university degree and participate in ongoing training . There are ” quality indicators of academic work , quality of teachers , installations and equipment , the management organization , but also of information and advertising , and regulatory compliance ” checked .